Cusco serves as the main gateway to Machu Picchu for tourists today, but it has been important for centuries. It was once the capital of the Incan empire, and even after the Incans fell it remained an important cultural center. The city center has retained a significant amount of its colonial architecture despite several major earthquakes. The heart of the old city is still beating, and it’s easy to close your eyes and imagine what it was like 400 years ago. My flight from Lima to Cusco was at mid-day. My first impression of the city was, of course, the altitude. Cusco is located at 11200 feet above sea level, and making that entire transition after a one hour flight is difficult. The plane’s descent only took about half the time as the ascent, and when disembarking it felt like the plane never quite landed. Just carrying baggage to the taxis is enough to get severely winded. As a result, the first evening in the city was pretty lazy, with almost no pictures taken. I needed the time to get my lungs in check. The next day, my only full day in the city, was spent wandering around and taking photos around the Historic District. This first photo wasn’t a bad way to start! I was staying at the wonderful Hostal Kuska, which enabled this view. The entire process: wake up, grab camera, leave room, walk five feet, turn right, point camera, shoot. The hotel, on top of being patient with my substandard Spanish and making excellent breakfast, has an amazing view (as will be seen again at the end of the post). 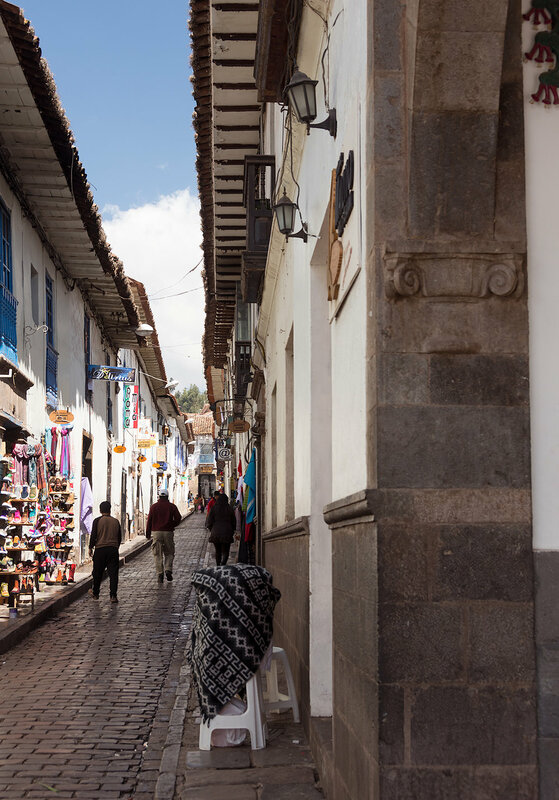 The streets of the historic center are extremely narrow and feature many small alleys. Most of the streets pre-date cars, which provides a significant challenge for motorists trying to navigate the city. When Jake picked me up a few days later, he got horribly lost. On this day, though, I didn’t have to worry about driving and only needed to explore. This is a terrible photo, but it shows off some of the weird anachronisms you can see in the city. There’s a definite “old meets new” vibe. In some strange ways, this feeling reminded me of downtown Shanghai. 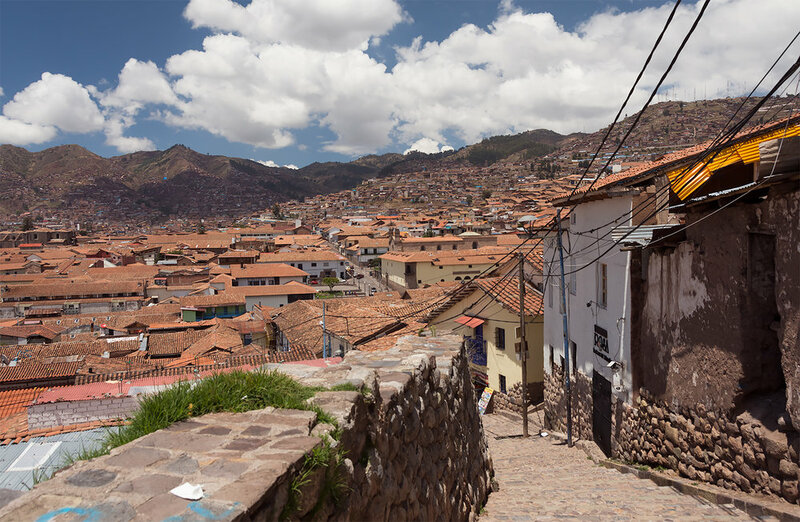 Cusco values its historical heritage deeply, but it’s not falling behind either. Cusco’s Plaza de Armas is the center of activity in the town. There are buildings dating back to the 16th century, many people selling arts and crafts (some handmade, as seen below) and great restaurants. I liked this statue enough to get photos in two different sets of weather conditions. The statue is of Pachacuti, who ruled in Incan empire in the 15th century. Some historians believe that Machu Picchu was built for him. In contrast to the rest of the plaza, this statue is quite new (unveiled in 2011). The recency of the statue, along with the contrast of an Incan figure to the colonial Spanish architecture of the rest of the plaza, has been quite controversial since the statue was erected. In the second photo, the tower of Iglesia de la Compañía de Jesus can be seen in the background. This church has stood at the head of the Plaza since 1576. Other old churches stand throughout the city. One thing that made wandering Cusco quite difficult were the many hills. The elevation makes this even harder, especially for the un-acclimated. By the end of the day I was starting to adjust, but I still had to stop to catch my breath frequently. The hills have their advantages, though. If you’re willing to lose your breath for a few minutes, there are some great views of the city and surrounding mountains to be seen. Here is a woman posing with her baby alpaca. I pet the alpaca after I took the picture. It was very soft. The late afternoon brought some spectacular light (and shadows) to the city. The first photo is of the dome and backside of the Iglesia de la Compañía de Jesus. The second is of an open-air craft market found after climbing yet more hills. And I’ve saved the best for last. This is (probably) one of my favorite photos of the whole trip. The Plaza de Armas can be seen in the foreground, along with a huge collection of Cusco’s spectacular architecture. The hotel’s view is well-known. Several couples were watching the sunset together at the front door. What a spectacular backdrop. My first stay in Cusco was only for about 40 hours, but it was enough for me to fall in love. The streets, hills, and people give it one of the most distinct characters of any place I’ve ever been. Even more impressive is that the city is on the doorstep of one of the biggest tourist attractions in the world and has not lost its soul. I will have to return someday, because I feel like I only scratched the surface. However, the next morning I was up at 5am, off to the train station to finally see Machu Picchu. That is where the story will continue.